A few weeks ago I had a chance to try out Blackjack's new product. 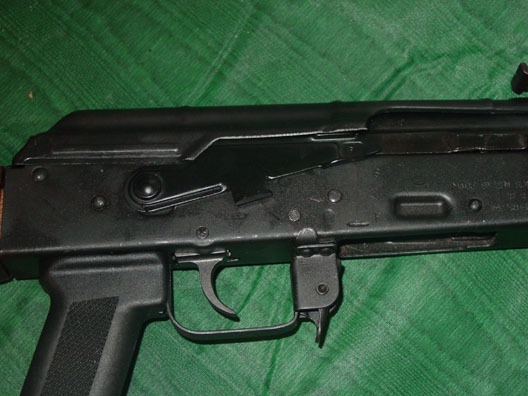 The AK swift safety lever. It came packaged in a manila envelope with no hint to its contents, always a good thing. The safety lever was packaged around a thick wad of bubble wrap to prevent it from taking damage during shipping. Basically what the swift safety lever does is replaces your original safety lever and fixes one of the most inherit flaws of the AK design. The inherit flaw is that one has to remove there hand from the rifle to move the safety lever from position to position. This can cost the user precious seconds of reaction time. By replacing the original safety with the swift lever the user can move the safety with ones finger instead of having to take your entire hand off the pistol grip. Though most of use our guns at the range and will hopefully never fire our AKs in anger, those few seconds to switch from safety to fire may not matter. However the swift lever makes a nice addition to ones rifle because you don't have to completely ruin your shooting position. For competition and tactical shooters it's a really welcome addition because it allows you shave a few tenths of second of your time, which can be the difference between placing first or not placing at all. After I received the swift safety lever it installed into my AK with out a problem. Using it at the range was a different story. I am a left-handed shooter so the swift lever was no different from the original safety because I have to remove my hand to switch positions anyway. So I switch shooting positions, I could manipulate the safety with my finger but it felt weird because my right hand is usually holding the rifle. I then enlisted the help of my friend who is right handed. He commented that when shooting on sandbags at that once you get the rifle lined up on target after a little practice you could switch the safety lever to fire with out having to look away from your target. He also made the comment that the lever is easier to switch down positions then it is to push up because of the strengths in your finger. BlackJack has sent me a lever designed more appropriately for the stamped rifle. The one I was using was originally designed for a milled receiver and thus was the reason the lever was so hard to push back up. This newer lever has a cut out designed to cleanly pass over the rivet on the stamped rifle that made it so hard to manipulate back into position. But one of the most notable features is that it partially fixes a second flaw with AK design. Since the AK design has no bolt open it can be a problem at ranges that require you to keep the bolt open when not shooting. This second lever design is also designed to hold your bolt open! When you are done shooting you can now pull the bolt back and move the lever to safe and it will hold your bolt open for you as pictured below. We also took it out on one of my rifles a few weeks ago and achieved better results with this lever because it glides across the receiver with very little resistance. Thus making it easy for one with little strength in their fingers to switch from Safety to Fire and back. So the problems I had with the first lever are Null and Void. As with the first lever this one is just as easy to install, so no special tools are required. Overall it is a very practical upgrade for ones AK because it removes TWO important flaws. The only negative thing we did not like about it was that only shooters that shoot right handed can take full advantage of the lever, but that's not to big of a deal because most people are right handed any way. To purchase one of these saftey levers click on the blackjack banner below.